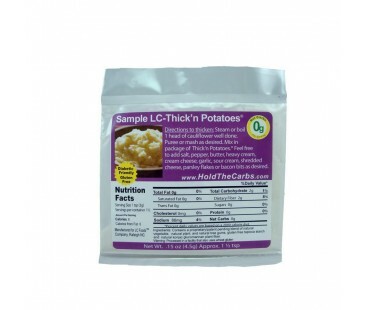 Sample size low carb thickener for fauxtatoes. ZERO net carbs! This is a 1-1/2 teaspoon sample to make one batch of cauliflower fauxtatoes so you can see how good they are. If you love mashed potatoes, but not the starchy carbs, here's the product for you! Now you can enjoy carb free, great tasting fauxtatoes. Use the recipe on the back of the package to whip up a batch, then use your imagination to spruce them up. Super easy to make - simply add some low carb thick n potatoes to your cooked cauliflower, mash and voila! The best tasting fauxtatoes you've had since you started the low carb lifestyle. Try adding some heavy cream, cream cheese, crumbled bacon or cheese for a nice change. Low carb Thick n Potatoes has a healthy dose of dietary fiber. As with all LC Foods low carb products, there's no sugar added (of course!) and no preservatives!